Hello All who call in at my blog. It is a diary of the sort of things I have made in the past and things I am making now, mostly for Cat Protection and other charities, to sell to raise funds. My daughter gives me the 'raw' ingredients and I make the goodies. We are having a strange patch in life where a lot of things aren't going too well. Poor Vic isn't well after a tooth extraction went very wrong. I am trying to be a good nurse and he is a very good patient thank goodness. It has meant I am sitting quietly and doing knitting and crocheting with the odd bit of mixed crafting thrown in as well. Here are some baby hedgehogs made from little bits of glittery wool found at the back of the wool cupboard. More kitty blankets and all of those were made from old garments I unpicked. I wanted to make something for the charity coffee morning at our doctor's surgery so I made chicks with Cadbury's eggs inside and some knitted flowers with chocolate eggs with no filling. 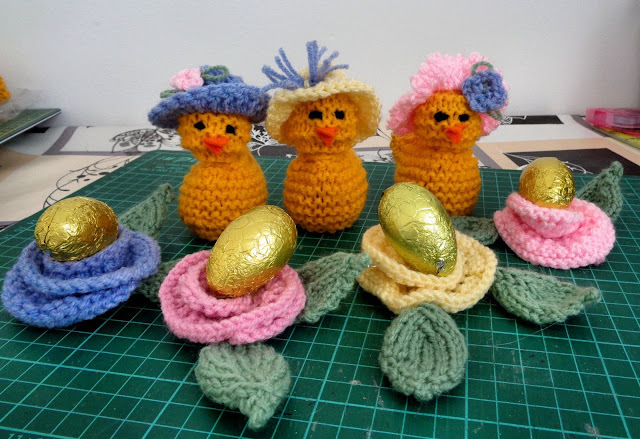 I used a glue gun to fasten the eggs in place on the flowers. The sale is on the last Friday of every month so plenty of time to take them there. Today I am going to make a few cards though haven't any ideas so far. I'm sorry Vic isn't feeling well. I love your hedgehogs. The chicks are adorable too. OOOH! What a wonderland here. 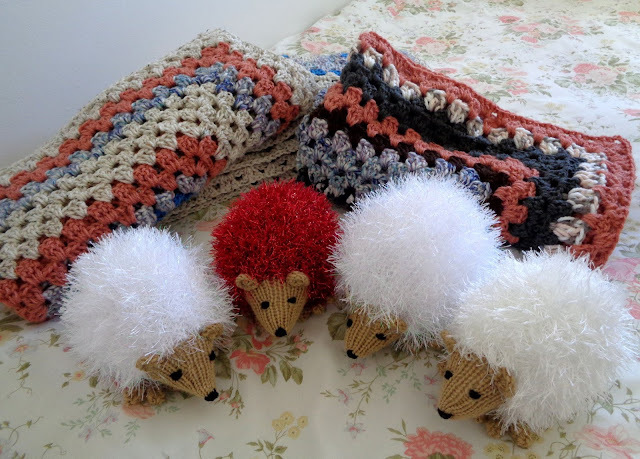 Love your adorable hedgehogs and other wonderful knitting. I hope Vic is well soon. Gorgeous makes Chrissie they all look so cute, i'm sure they will be sold quickly when they go for sale. I hope Vic feels better soon. SO sorry to read about Vic. I hope all is well soon. Thanks for visiting while I was offline. It means the world to me. I'm so late to this post, but I just had to comment on the lovely hedgehogs and chicks, they are great. Hope Vic is feeling much better now.